Hi fellow FIT BFFs! I often return from the gym famished after an intense workout. It would be easy to chow down on whatever I can quickly get my hands on, but I want to be sure to replenish my body properly. 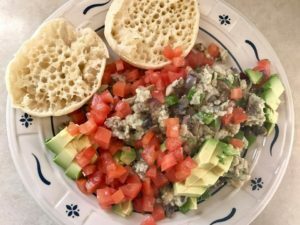 I’ve made a variety of these throw-together kind of scrambles and found this combination to be a generously portioned, relatively low-cal, high protein powerhouse. The bonus…teamed with an english muffin, my appetite is satisfied for hours! In small bowl, beat egg/egg whites with wire whisk; place in non-stick cooking sprayed small fry pan. Mix in onion, bell pepper and mushrooms. Cook over low heat. Occasionally loosening contents from the bottom of the pan and turning, as you would scramble plain eggs. Continue scrambling until egg appears cooked. Add shredded cheddar and mix with the scramble. Once cheese begins to melt, immediately plate mixture and top with tomato and avocado. Salt and pepper to taste. Makes one serving at 282 calories with 25 grams of protein! Add an english muffin for meal total of about 400 calories!